When I was in High School (many years ago!) I went through a long phase of eye shadow experimenting. I used to save up the lunch money that my dad gave me to buy Pupa eye shadows at the Profumeria (which in Italian means perfume shop, but sells makeup as well). I just loved mixing colors and giving myself intense smoky eye looks, and my friend and I spent hours every weekend making up our faces. Eye shadows were definitely my favorite makeup item. Long story short, when I began to switch to “green” brands I had a really hard time finding eye shadows that were nicely pigmented, blendable, and as easy to use as my old favorites made by my old favorites Dior, Chanel, Helena Rubinstein. That was until I recently found some that I really like and below are those that I currently keep for everyday use in my Leopard Z-Palette. Kjaer Weis Cloud Nine – A pale champagne shade that is perfect to highlight brow bone, inner corner and center of the lid, or just to even out the color of the lids if it matches your skin tone. The pigmentation is sheer/medium, so I love to use it for daytime highlighting when I want to keep the look soft and pretty. The texture is soft, but not powdery and the finish is luminous, but still subtle. Afterglow Feather* – A “light pearlized pink”. It is a very pigmented pale pink and has a pearl/frost finish. I like to use it as a highlight shade, but I make sure to tap off excess product from the brush before applying it because it is very pigmented and also a bit powdery. However, the texture is soft, blends like butter, and once applied it does not budge. Afterglow Baroque*– Already reviewed here. A “light peachy amber” shade that I like to apply on the center of the lid to add a touch of peachy sheen. The texture is soft, creamy, and easy to work with. I even apply it with my fingers sometimes. Kjaer Weis Magnetic* – A “luminous cocoa mink” with a satin finish, Magnetic is perfect if you like golden browns. The texture is blendable and it has good pigmentation. I think that it would look particularly amazing on blue and green eyed gals. I am wearing it in this FOTD here. It has some very subtle coppery particles in it. Ecco Bella Deep Taupe *– A completely matte brown, that is very similar to Magnetic, but has no shimmer and looks more like a simple warm brown. I like to use this shadow in the crease to contour and give a little bit of extra dimension to my eye lids. Also, this may be a good natural dupe for MAC Espresso, maybe just a hint warmer. Afterglow Impasto* – I am in love with this shade! It is a matte “khaki brown with a green undertone”, and it is so versatile. 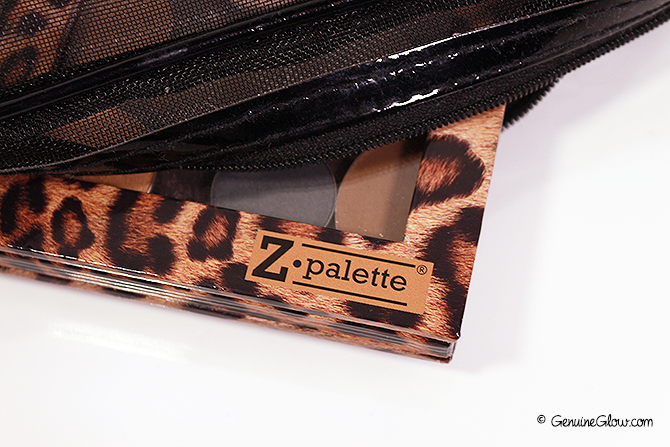 From subtle contouring of the eye to soft or strong smoky eye, it’s a shade that could suit almost everyone. To me, Impasto is the new taupe. It is less creamy than the other Afterglow eye shadows, but still a great a formula that blends easily. It is not powdery. Afterglow Stencil* – A very unique “taupe brown” shade with a cool undertone and a subtle golden shimmer. 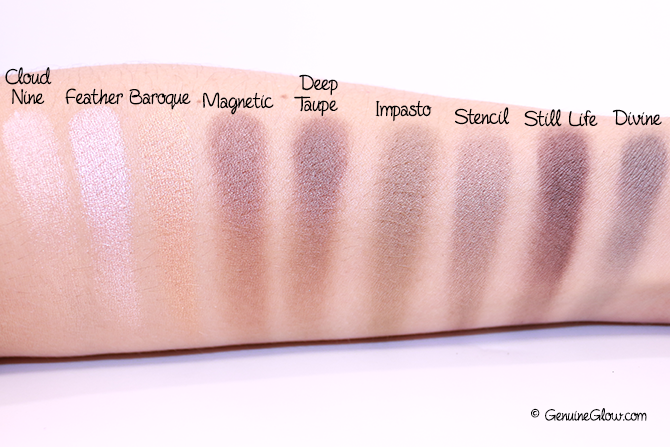 It is very wearable, pigmented, and blends wonderfully. I like to use it for a quick, soft smoky eye. Afterglow Still Life* – ‘Rich chocolate brown” that is completely matte and I like to use for stronger eye looks. It is very pigmented and the formula is less creamy than the other Afterglow eyeshadows and is a bit powdery. I just make sure not to apply too much product because the color is so rich! Once applied, it does not fall out. I reviewed it here. Kjaer Weis Divine – A “matte smoke graphite grey” that I already reviewed here. It is my ultimate eye shadow if I want to create a strong, gray smoky eye. Great color payoff and and soft texture. What are your favorite eyeshadows? Is there one that you would recommend that I purchase?